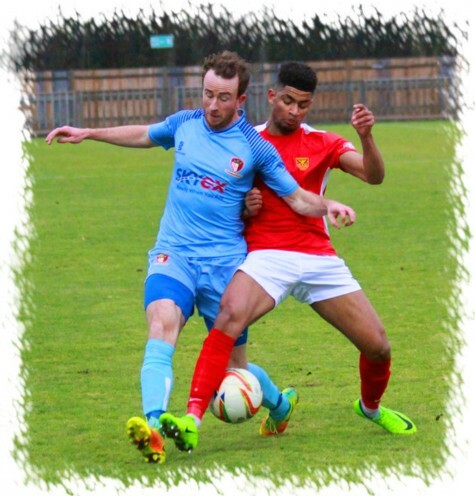 Hayes and Yeading were undone by “one of their own” as former United striker Dylan Kearney struck twice and set up a third as neighbours Uxbridge inflicted a second defeat in five days on Paul Hughes’ side. 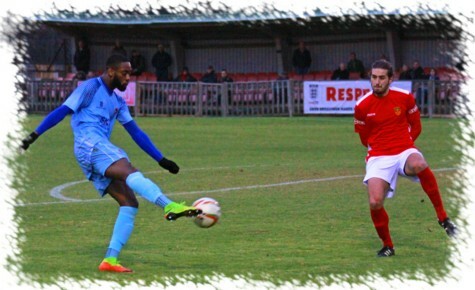 With Paul Hughes side already hit with the loss to illness of top scorer Manny Duku, United were hit again in just the fifth minute with fellow striker Duncan Culley forced to leave the field with an injury which saw him replaced by defender Smith Tiesse with Toby Little moving forwards. 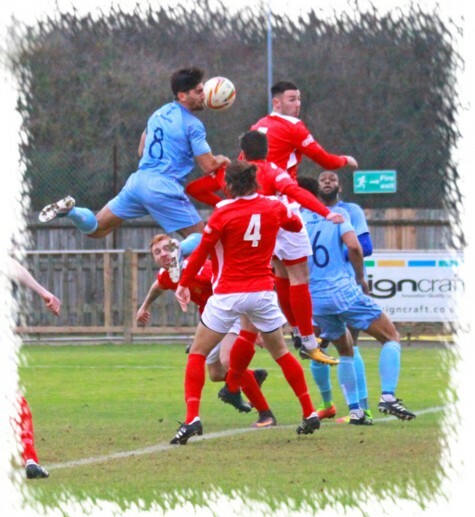 The opening fifteen minutes saw United dominate proceedings, forcing several corners which sadly pretty much all came to nothing with home skipper Paul McCarthy having little to do in the Uxbridge goal. McCarthy however was called into action on 20 minutes when Andrew Ofosu and Spyros Mentis combined to create a shooting chance for Scott Donnelly, the midfielders shot being pushed around the post by McCarthy diving to his left. Four minutes later with pretty much their first real attack of the game, the home side took the lead, with two former United under 18s combining. Ben Peden raced away from halfway down the right flank, Tiesse saw him to the corner only for the Reds defender to be allowed past along the bye-line into the box, his low centre then being swept home by Kearney, beating Jack Smith at his near post. Despite going behind United continued to dominate the game without finding the net. New signing Ryan Kinnane saw a header from a Donnelly corner being held by McCarthy before Donnelly himself was just too high with a free-kick from just outside the Reds box. A minute before the break McCarthy again kept his clean sheet intact, Ofosu smartly turned his marker on the corner of the box before firing low, his effort that would have sneaked in at the near post being tipped wide by the diving ‘keeper. Despite going in behind at half-time, United had shown enough to say that a comeback was within their grasp, however this was soon shot to pieces as the home side took less than 40 seconds from the re-start to find the net again. From kick-off the ball was played wide left to Kearney, he waltzed past Matt Hall and pulled the ball back to Rhys Rabess who slotted the ball home between Smith’s legs. Just before the hour mark, United were again denied by McCarthy as the home stopper pushed away a Little free-kick that looked to be heading for the corner of the Uxbridge net. At the midway point of the second half, it was Jack Smith who was needed to keep the deficit down as Luke Maguire cut in from the left and unleashed a low 20 yard drive that the United ‘keeper did well to push away for a corner. Sadly this corner was to see the home side score a third as Smith under pressure from Kearney missed his punch and the Uxbridge striker duly headed home from close range. The final ten minutes saw two excellent chances come, and go, for United. Ofosu’s cross from the left picked out substitute Stephen Ellery in the middle but with just McCarthy to beat he headed wide of the far post, and minutes later Luke Joyce-Dwarika was tripped in the box and referee Gilroy pointed to the spot. With all three regular takers out of the side, Little took responsibility only to see his kick pushed away by McCarthy diving to his right and that pretty much summed up United’s afternoon in front of goal. United Man of the Match: Luke Joyce-Dwarika.